It's Saturn Claus! Every Christmas Eve Saturn Claus hitches his sleigh to a shooting star and delivers presents to all the good little creatures on the planets that Santa Claus misses. He spreads goodwill and Christmas cheer to the farthest corners of the Galaxy! He debuted the cover of the San Fransisco Chronicle's Datebook this Sunday. This is a little late but for those of you who missed it I just released the 7th (and final official) wave of Calling All Cars. Enjoy the last days of 2009 by reading the latest issue of II LOVE, the Blank issue!! There's not much text in this issue, mainly photos, a perfect relax during these busy and stressing Fiesta days!! All the best to all of you on NPT!! "A whole edition which is only about the shapes paper can be, without distracting colours and complex skins. A celebration of the beauty of paper." 6 new characters are now available. More info here. Happy Holidays! Cubehmals have another detail revealed... They're electric! Electric Cubehmals collaboration due to be released in February 2010.
get Your Santa on pepakura.net! for sure it´s free! You like to share Your toys & crafts too? so come on, join us! Hello everyone!! i really could use some good comment on this new design that i have? im open for comment, suggestion and critics!! thanks! Starting the year off right! The last official Urban Paper show will be held at Rivet-Designer Toy and Art Gallery on January 2! If your in the area of Columbus Ohio please come out and say hey. It will feature the Urban paper traveling exhibit and a couple new surprises as well. ITS ME AM BACK! But why has it been so long? Well First I had to keep up with schoolwork(my dad only cares about if I do well in math) and I've been working on my website(and this project). And if any has gotten pissed, angry, or sad that I haven't been around but let me tell you am BACK. This is part 1 of PROJECT MUSHROOM! 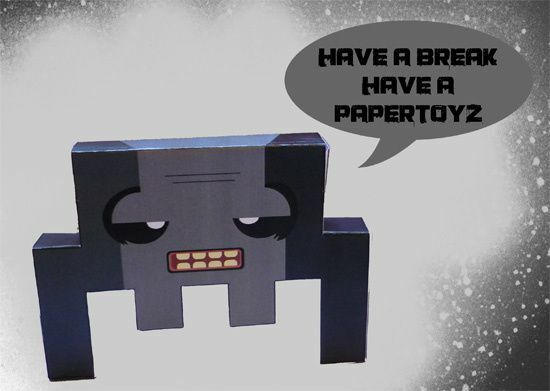 Free Christmas paper toy downloads! Finally got round to it.... head to my website now and you can download the other nets of the rest of my Christmas series for FREE, but please don't misuse or re-produce for profit, and if you do make them up and post photos it would be great if you could credit me. Thanks and enjoy! Hot paper has ground to a halt due to a number of factors, so to make it up to you im releasing klink and clank. Plus I was originaly going to sell it on Peperkura for 100 credits, but as an extra christmas gift it'l be 100% free! All i need to know is how to directly link to a PDF, any help? My new ye-boT made for the FabFibe show, which opens tomorrow in Singapore! Feast your eyes, internet. BEHOLD. MY FIRST COMPLETED PAPER TOY! You can get the latest model in the KaL series, KaL-10 (simple update to KaL-09) in the latest issue of ImagineFX Magazine. More info here.